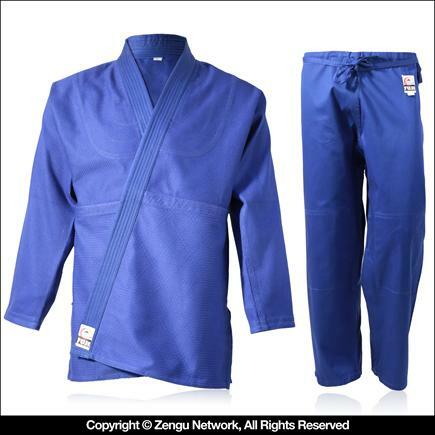 Judo Gi (Blue) & other great retail gear is available. Buy Now! Appropriate for instructors during high heat training, as well as students looking to acquire a gi above normal "starter" quality. The blue single weave, poly cotton blend construction is extremely comfortable and durable, built to withstand the normal rigors of grappling training. 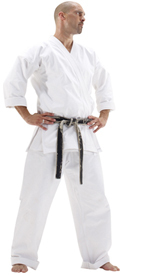 As such, this gi can be used for judo, jujitsu, aikido and any other similar art. The cut is based off of judo design with it's generous space and lack of tie straps. Q. What's the chart size? A. What's the chart size? Comment. What's the chart size? Q. What's the size chart? A. What's the size chart? Comment. What's the size chart? Q. What's the retail price? A. What's the retail price? Comment. What's the retail price? Q. Will you have a blue judo or jiu-jitsu gi available in separates anytime soon? I have a student with these requirements. I've found pants for jiu-jitsu and I've . . .
A. Will you have a blue judo or jiu-jitsu gi available in separates anytime soon? I have a student with these requirements. I've found pants for jiu-jitsu and I've . . . Comment. Will you have a blue judo or jiu-jitsu gi available in separates anytime soon? I have a student with these requirements. I've found pants for jiu-jitsu and I've . . .
Hi Eduardo. We were able to separate the white KD Elite uniforms because we were in control of the production. Unfortunately, we don't control production over any blue uniforms at this time. That being said, we are always on the lookout for a manufacturer who is willing to do separates and will offer them as soon as we get the chance. Yes we've seen that happen once or twice before. We offer as low of prices as we can here on Zengu but sometimes a free shipping offer trumps that. As you might imagine, it is fiscally impossible to offer prices this low and also eat the cost of shipping on the same site. Q. How does your sizing run? A. How does your sizing run? Comment. How does your sizing run? Q. I disagree, the prices here are very fair for the quality gis and the fast shipping. We have been ordering here for a few years and have only . . .
A. I disagree, the prices here are very fair for the quality gis and the fast shipping. We have been ordering here for a few years and have only . . . Comment. I disagree, the prices here are very fair for the quality gis and the fast shipping. We have been ordering here for a few years and have only . . . I disagree, the prices here are very fair for the quality gis and the fast shipping. We have been ordering here for a few years and have only had a few minor hiccups. I am very pleased with Zengu's service. I am also a school owner and have searched many sites and almost always come back to this site. Q. Is the small a kids small or an adult small? A. Is the small a kids small or an adult small? Comment. Is the small a kids small or an adult small? Q. Our school has ordered several of these Gi. Every one has been high in quality, reasonably priced, and stands up to a lot of pulling, choking, throwing, and . . .
A. Our school has ordered several of these Gi. Every one has been high in quality, reasonably priced, and stands up to a lot of pulling, choking, throwing, and . . . Comment. Our school has ordered several of these Gi. Every one has been high in quality, reasonably priced, and stands up to a lot of pulling, choking, throwing, and . . .
Our school has ordered several of these Gi. Every one has been high in quality, reasonably priced, and stands up to a lot of pulling, choking, throwing, and everything else you would want in a grappling art gi. I would not hesitate to buy more when the need arises. Q. I wish you guys still sold it!!! It is comfortable and so, so, fly!!! Everyone loved it and wanted one!!! Let me know if you ever put it . . .
A. I wish you guys still sold it!!! It is comfortable and so, so, fly!!! Everyone loved it and wanted one!!! Let me know if you ever put it . . . Comment. I wish you guys still sold it!!! It is comfortable and so, so, fly!!! Everyone loved it and wanted one!!! Let me know if you ever put it . . .
Q. I'm looking for the sizing chart for Gi's Fuji style. 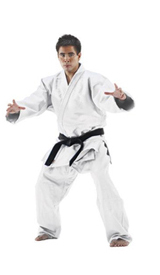 A. I'm looking for the sizing chart for Gi's Fuji style. Comment. I'm looking for the sizing chart for Gi's Fuji style. This page has a size chart. Look right below the name of the product "Judo Gi Blue". you'll see a link. My son is 5'1 and 120lbs. Which size would be better an A1 or A2? Thanks. I already knew my Judo GI size from my other previous purchases from various sources. Size 3. This gi size was perfectly accurate and fit great. The pictures don't do justice to the gorgeous color. When you receive yours, you will wish you ordered two. I hope to purchase another after this one. 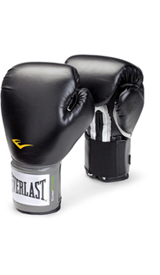 The material will convey to you instantly that you have purchased a high quality item. I get excited & proud every time I wear this gi. Thank you guys!! Hello! My name is Pab and I would like to know what size to buy in the Fuji "All purpose Judo gi"? I'am 5'11" tall, walk around at 211 lbs. and a meso/endomorph. I strictly hot wash and dry since I live in NYC and have neither time nor space for hang-drying. I like the tapered European fit, but I dont want anything too snug. Hi Ronin. I think the size 5 is probably your safest bet. It might be a little big pre-wash, but since you are shrinking intentionally it should come down to the right fit. I have this go in White but had to buy larger pants do you sell for example I would need a 5 in jacket and a 6 in pants as a woman I am larger in the hips ?? Hi Jwilmer. 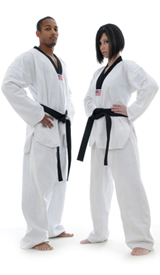 We do not have separate size ordering for this gi just yet. We are trying to integrate that with our manufacturers, but it's going to take time before they can produce all of their products and package them as mix-and-match. My granddaughter is 4'9" tall, and weighs 105 lbs. I think at the moment a size 1 would be best. You could also go size 2 and let her grow into it a little. I'm 5'6"/190lb. What size should i get? Assuming it's accidentally washed in hot or dried in a dryer? I think the size 4 would fit you, although a 5 would provide some nice room for error in terms of shrinking in the wash.
Hi Jerry. That's going to depend on the weather and whichever shipping option you selected. That being said, usually shipping is expedient - coming in at under 7-10 business days (although 7-10 is the generally accepted length). Does this product have the same 60-day return policy at the BJJ Gis on your rollmore.com site? Hi Ian. You can check out specific MAS return/exchange policies here: http://www.martialartssupplies.com/csupport-exchange.html. I am 6' 240 should I get the 6 or 7? I would recommend the size 6. I think it will suitably large without feeling excessively baggy. Yes our sizing chart seems to recommend slightly larger sizes. Since you've tried a 3 before and know you like it, go with the 3 again. Would it be better to buy by height or by weight. I am on the short side but a little heavier. I am 5' and about 155lbs so should i get a size 3 or 4? I think you would be safe going with the size 3. Hello, I am 5'10, 165lbs. Is it safe to trust a size 5 will fit me? Also, I own a Fuji Victory BJJ Kimono size A3. The embroidered badge on the left shoulder and upper middle back add a nice detail to the gi. Does this single weave Judo gi have the same factory embroidered badges? Hi Nick. The size 4 would be form fitting for you and would not allow any forgiveness for shrinking in the wash. A size 5 would be a little baggier but could also be strategically shrunk. This gi comes with patches that are not sewn on, which you can sew on at your discretion. Hi Nick. Yes a size 5 would work. I also think a size 4 could work if you were looking for something form fitting. This uniform does come with an optional patch which you can sew on at your discretion. The gi quality is awesome, especially for the very low price. The problem I ran into is the sizing. I followed the sizing chart but the gi is way too big. I'm 6'2" and 195 and the size 6 jacket swallows me up. The pants fit just about right. I hot washed and hot dried the uniform probably 8 times and the jacket is still way too big. I should say that the sleeve length is good on my wrist but the jacket skirt comes down too low and overall over sized (probably would be good for someone around 250 pounds). But I'm not giving up on this gi so today I ordered a size 5 and will review how it fits later. The size 4 has fit almost perfectly which is really strange that I would be that small of a size. Also, my wife who is 5'5 ended up needing a size 3 and she is normal weight. I had shipped a size 1, which was too small as well as a size 2. That ended up okay as they fit my children. If you can get the right size, they are excellent for the price. And if you are wondering about this verses a double weave, DON'T get a double. They are way too heavy and hot. I am 6'2 and 185 and train every week and these single weaves have minimal wear so far. I am about 5 8 and 230 pounds. I'm not sure what size to get. looking at 5 or 6. My buddy had a size 7 and it seem to be a little to big on me. Size 5 is perfect for your height but you might find it a little tight around the midsection. One thing you could do is go 6 and do a little wash shrinking if you there is too much space. I think a size 5 would be the best possible compromise of width and height for you. I just recently recieved this gi, and i love it, but the belt that came with it was way to small, the tabs were only like two-inchs long once tied. What size belt do you think i need to order to fix this problem? By the way, the gi was a size 2. Sorry lakeb but we can't really know that without knowing your body dimensions. Do you think that Gi would work okay for jiu jitsu, not in tournaments or anything, just for free rolling at my house. Yes this would work fine. The only significant difference is that judo gi tend to be cut a little looser, where as jujutsu specific gi are more form fitting. im about 5ft 110pounds, what size would be best for me, i looked at the chart i think a size 2 would work, but i just want to be sure. Size 2 seems like a pretty perfect fit. Although I will say if you like a more form fit type of gi with less bagginess you would fit in a size 1 fine. My son and I were looking to buy blue gi. We already had double-weave white ones, so we considered going with a single weave for the blue. I was a little dubious about whether a single weave would be sturdy enough. I am very pleased the Fuji gi. They are well-constructed and the fit is very comfortable. The fit of the pants is better than my other gi, with a higher rise in the waist. My son was recently in a tournament and he wore the Fuji blue gi and seeing it side-by-side with the other blue gi worn by the other competitors, the shade of blue is very pleasing and the quality was apparent. I'd recommend it to anyone. If you're looking for sizing comparisons, I'm 6'1" and 205 lbs. A size 6 fits perfectly after it shrinks after a few washes. My son is about 5'7" and 135 lbs, and he took a size 4. Hello. I am about 5'6" and weight around 175 lbs. Waist size about 34". What size do you recomend. I think a size 4 is going to be the most comfortable for you. I am 5'9" and weigh 260lbs. What size should I get? A size #6 would probably be your best bet in terms of height vs width. If a lot of your weight settles around the midsection, you could go with a size #7 and hem the pants and sleeves. im 5'3",about 51kg, what size recomend?? A size 2 would be a comfortable fit. If you prefer a more form fit gi go with the size 1. I've been doing judo for about a year and a half. When I bought my first gi I wanted to get a double weave. It works great, but man is it hot! And makes laundry a pain. So I wanted to get a lighter weight gi to stay cooler at practice and reduce my wife's laundry stress on Judo nights. So I found the Fuji Single Weave. I decided to get blue simply because I already have a white gi. I know some judo places don't like students wearing blue, but my sensei doesn't care. It is very comfortable, and while it is lighter weight than my double weave, it is very tough, and so far has held up great under a lot of pulling, tugging, throwing, twisting, etc. I weigh close to 200 lbs and I have no concerns about it ripping. Practice is much more comfortable, I don't create puddles of sweat on the mats (as much), and it air dries in about 24 hours as opposed to my double, which takes about 4 days for the jacket. The color is a very nice deep blue and has not faded at all. It shrank about as much as the tags said it would, so it fits me just right. I am very very happy with the quality of this gi, especially with the low price. It was delivered promptly and has worked out great! This is a very nice looking Gi. That aside, .. for some reason its fit is (in my opinion) not standard. I have purchased a number of different Gis in the past. The differences between sizes is with this one is significant. With us, it was way too small.... the next size was way too big.